That’s one hell of a baobab picture, Sig. Did you take it? Beautiful. Why has no one commented on it, I wonder? The uncle of my ex-partner in NY wrote a good book, partly about the baobab, called The Tree Where Man Was Born. Yes, I took the picture. I also planted the seeds of the baobab fruits, and they germinated into little baobabs, but one day — or rather one night — the damn dog exterminated everything. I really like going to that tree whenever I can. Apparently it is the largest on the island. I don’t know if you have seen pictures of baobabs in Madagascar, the place on earth where you have the greatest number of species. Some of them near Morondava are spectacular. The closest I’m likely to come in the near future is via google. I’ll look them up. The closest I’m likely to come in the near future is via google. Is that the natural form of the tree, or has it been coppiced? « Coppiced », that’s something I had to look for in the dictionary… Coppice: Adoption of Old French copeïz, couppeiz, colpeïz, says the SOED. Coppiced: cut down periodically. Well, no, I don’t think anybody goes down there to cut it periodically. It’s far from any road, power line or construction (it’s just in a sugar cane field), so there would be no need for anybody to trim it. Anyway it’s too big to do it. Moreover, when the branches get thinner they become rather brittle, which would make it dangerous to get to the smaller external branches. (Baobab is no hardwood. I don’t think it’s even softwood.) However, periodic cyclones must have had a trimming effect on this tree, like on all Martian trees. 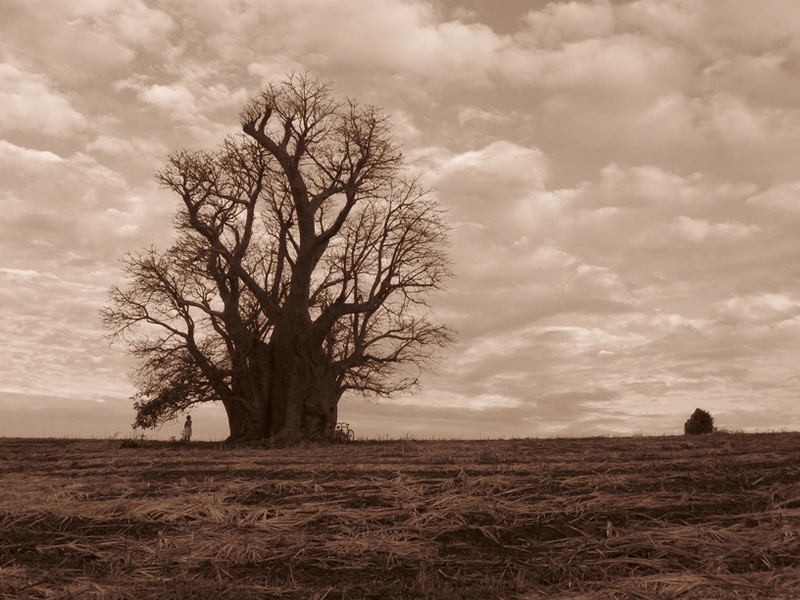 This baobab might be several centuries old though, and survived the likes of Carol and Gervaise — even 1892. Trimmed by cyclones, so both natural and coppiced. Thank you. « To coppice » is « at styne » in Danish. Traditionally done to willows. The shoots then used to for barrelhoops – for instance for casks of Lurpak butter. Well, if that definition is correct I don’t think it can apply to this baobab tree. Should some stupid persons wish to cut it down to grown level, I have no idea how they would do it. The trunk is so large it looks like a little mountain, and I don’t see any chainsaw being able to come anywhere near its centre. Sili, isn’t there another way to contain butter than to do it by cutting down willows? Poor trees, that must make them weep somehow. Great picture — my thanks to AJP for sending me to it! LH, you might have to buy a ticket too, and sit next to Crown for many hours. Sig, you can coppice (virtually?) all of the deciduous trees we get in Britain; people seem to have done since pre-history. One consequence is that nobody knows how our ancestors cleared the primeval woodland for agriculture: if every tree you cut down just grows back again, how do you create a field? Dearième: if every tree you cut down just grows back again, how do you create a field? Eucalyptuses are fast-growing trees that are used for wood here, especially for rondins* (i.e. timber posts that are used as scaffolding or props in the construction industry, or to make posts for fences for instance). Very often the tree is cut down to ground level and fairly rapidly small trunks/branches spring up again. Some say you can’t kill an eucalyptus tree. Amazing photo. I can practically see the clouds moving by on the screen. Do you? Well, you’d be right because in winter clouds tend to move fast due to the trade winds blowing stronger. Eucalyptus looks very much like the big birch that grow here. My first wife said eucalyptus smelt like cat-pee, but that was in California. I like the Australian ones better. AJP, I don’t quite know what cat pee smells, but eucalyptuses definitely have a characteristic fragrance. I remember a place where I used to go jogging on my way to home after work, near a river by a mountain, and at a certain time of the year the little eucalyptus wood on the way smelt like nothing else in the world. Baobabs don’t smell anything. They have other means of being noticed. I recall being told, on a visit to northern California, that Eucalyptus had been introduced to North America for its timber, but that when removed from its native soil (or maybe climate?) it did not grow straight enough to be useful; or something like that. The trees smelled lovely to me, though. I also enjoyed the shapes of their nuts, which lay profusely on the ground; they looked like they were designed to fit some exotic screwdrivers. I was in California a few weeks ago and I have been to Australia too, and eucalyptus smells very nice. Eucalyptus is used medicinally too, for instance for eucalyptus cough syrup. Perhaps the first Mrs. Crown had an unusual sense of smell? Siganus, in your tropical island cats probably live mostly outside. In countries where people and cats stay indoors for months, cat pee can be a problem. I once accompanied a friend into a used book store from which I had to flee after just a few minutes, so strong and overpowering was the stench of cat pee emanating from four or five cats lounging among the books. I wondered how the store could manage to stay open, the owner must have had other means of support. That sounds strange to me as I have never seen a nut on any eucalyptus tree. It seems to me that the species we have over here (at least two of them, the « white » and the « red » eucalyptus) do not bear fruit. Do you have a photo of these fancy nuts somewhere? Here are some. Maybe « dried seed-pods » would be more accurate than « nuts ». The ones that I saw were less elaborate than most of the ones in the picture, but they still caught my fancy. They looked like the small dark one partly hidden in the back, or like the one on the right but with less of a thick outer rim. One thing about them was that the side away from the stem had N deep depressions (where seeds had fallen out?) arranged in a round pattern, but N was not a constant. Aha! Scrolling further down the linked page, I now see exactly what I was describing. Vide, the seed-pods that appear on the page you linked to above have amazing shapes. One can barely believe they are natural at all. I have never seen anything like that before. As I said, the eucalyptuses that grow here don’t have any visible seeds. However, they must have microscopic ones because every now and then a small eucalyptus springs up in our garden. Our neighbours have two big eucalyptus trees in their garden and I suppose there are seeds that must be flying from their place to ours, but I have never seen any with my naked eyes.